Caring for your copper sink is surprisingly easy, they’re virtually maintenance free. For basic cleaning simply use a mild soap and water—other cleaners are not necessary. The one precaution we advise is to avoid leaving harsh chemicals and acidic foods in a copper sink. These can temporarily lighten a copper sink’s patina finish—whether a natural patina or an applied patina finish. Therefore, we recommend you avoid using harsh chemicals or abrasive materials on any copper products. With the exception of a SoLuna Matte Copper sink that you want to remain shiny, don’t use copper polish on any copper sink. Regardless of which SoLuna patina you choose, a copper finish is a living finish and never really stops changing in color. The gradual evolution of a copper finish is an interesting process. As the surface ages and mellows it becomes even more handsome. If you like, you can greatly reduce this change with the use of wax (see below). As with any sink, if you live in an area where the water has a high mineral content, you may want to wipe your sink down periodically with a soft cloth to avoid water spotting. For extra protection, a product such as Renaissance Wax may be applied periodically to the clean copper surface. This will help maintain the luster and provide faster water runoff. 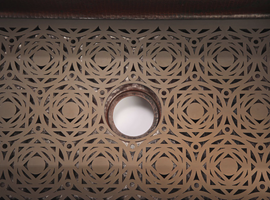 Consider a sink grate as another way to enhance the look of your beautiful copper sink. Enjoy the living qualities of your beautiful, hand hammered SoLuna sink—it’s truly a unique and functional work of art! Wiping your sink down with soap and water is generally all the cleaning your SoLuna copper sink will need. Be sure to keep copper cleaners, copper polishes, chemical cleaners and scrubbing pads away from your copper sink as they can all remove the color. Acidic foods such as lemon, salsa and ketchup can lighten the finish too if they are left sitting in the sink. This will not hurt the sink itself, and the patina will naturally darken again. You can darken light spots further with a home darkening remedy of 1 teaspoon salt dissolved in ¼ cup ammonia. Apply the solution to the light areas, let dry for 30 minutes and repeat until the spot matches the rest of the sink. 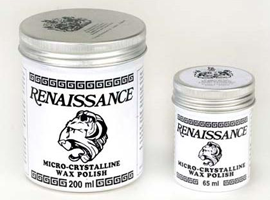 Apply Renaissance Wax to protect the newly patinaed area. Your Café Natural finished sink will continue to change in tone and may develop some lighter and darker areas with time. You can maintain the even coloration by regular applications of Renaissance Wax or carnauba wax. You can also have your copper sink pre-waxed by us at the factory. SoLuna’s Matte Copper finish can be treated in two ways—you can leave it to patina naturally or maintain it in the bright shiny, new copper state. The first option will be the lowest maintenance of all copper sinks—simply wash the sink with soap and water and let it patina naturally. The shiny option will be the highest maintenance, and is the only finish on which you can use a copper cleaner. Polish the sink every so often to remove the patina and bring the luster of the bright copper back again. After polishing, we recommend you apply a coat of Renaissance Wax to give the finish a little protection and extend the time between polishings. Most homeowners today are familiar with stainless steel sinks. But nickel plating is completely different. Plated nickel is more like silver plate—it will gradually develop a patina over time. Most common metal cleaners can be used to brighten the nickel finish periodically, but use them carefully. The nickel plating is only a thin layer covering copper. Overzealous rubbing can remove some of the nickel, allowing the copper color to show through. Also, if the copper portions of your sink have a patina, keep the metal cleaner away from the copper. We recommend using Renaissance Wax or carnauba wax on these sinks to avoid metal cleaner mishaps.